This image, captured from NASA Television’s live coverage, shows SpaceX’s Dragon spacecraft departing the International Space Station at 6:10 a.m., EDT, Aug. 26, 2016, after successfully delivering almost 5,000 pounds of supplies and scientific cargo on its ninth resupply mission to the orbiting laboratory. SpaceX’s Dragon cargo spacecraft splashed down in the Pacific Ocean at 11:47 a.m. EDT Friday, Aug. 26, southwest of Baja California with more than 3,000 pounds of NASA cargo, science and technology demonstration samples from the International Space Station. 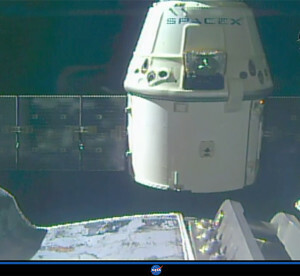 The Dragon spacecraft will be taken by ship to a port near Los Angeles, where some cargo will be removed and returned to NASA immediately. Dragon then will be prepared for a return trip to SpaceX’s test facility in McGregor, Texas, for processing. When it arrived at the station July 20, Dragon delivered the first of two international docking adapters in its external cargo hold, or “trunk.” The IDAs will be used by commercial spacecraft now in development for transporting astronauts to the station as part of NASA’s Commercial Crew Program. The initial adapter was installed during an Aug. 19 spacewalk by Expedition 48 Commander Jeff Williams and Flight Engineer Kate Rubins of NASA. The second adapter is being built and will be delivered on a future Dragon cargo resupply mission. Among the experiment samples returning Friday are those from the Heart Cells study, which is looking at how microgravity affects human heart cells. The U.S. National Laboratory investigation is studying how microgravity changes the human heart, and how those changes vary between individuals. Deep space missions including the journey to Mars will require long periods of space travel, which creates increased risk of health problems such as muscle atrophy, including possible atrophy of the heart muscle. Heart cells cultured aboard the space station for one month will be analyzed for cellular and molecular changes. Results could advance the study of heart disease and the development of drugs and cell replacement therapy. Samples will also be returned from two rodent-based investigations, the Mouse Epigenetics and Rodent Research-3-Eli Lilly experiments. The mouse model is useful for showing how much shorter stays by mice in the low-Earth environment can be used to infer how similar conditions may affect future human exploration. In Mouse Epigenetics, researchers are exploring altered gene expression and DNA by tracking changes in the organs of male mice that spend one month in space, and examining changes in the DNA of their offspring. In Rodent Research-3-Eli Lilly, scientists are looking at rapid loss of bone and muscle mass in the legs and spine, and comparing it to what is experienced by people with muscle wasting diseases or with limited mobility on Earth and testing an antibody known to prevent muscle wasting in mice on Earth. This U.S. National Laboratory experiment is sponsored by pharmaceutical company Eli Lilly and Co. and the Center for the Advancement of Science in Space. Also returning are samples from the Multi-Omics experiment. This research is analyzing the composition of microbes in the human digestive system and how they may affect the human immune system. Researchers may be able to identify bacterial or metabolic biomarkers that could be useful for astronaut health management, and therefore future human exploration of the solar system. Dragon is currently the only space station resupply spacecraft able to return a significant amount of cargo to Earth. The spacecraft lifted off from Cape Canaveral Air Force Station in Florida July 18 carrying almost 5,000 pounds of supplies and scientific cargo on the company’s ninth commercial resupply mission to the station. The International Space Station is a convergence of science, technology and human innovation that demonstrates new technologies and makes research breakthroughs not possible on Earth. The space station has been occupied continuously since November 2000. In that time, more than 200 people and a variety of international and commercial spacecraft have visited the orbiting laboratory. The space station remains the springboard to NASA’s next great leap in human space exploration, including the journey to Mars.